Lister is set to launch its first modern road car since the legendary Jaguar XJS-based Lister Storm of 1993. The new Jaguar F-type-based Thunder will be the fastest, most powerful and most luxurious Lister made in the company's 65-year heritage. It will be built alongside the company's continuation models of the iconic 1950s Lister Knobbly at the historic George Lister Engineering factory in Cambridge, UK, where the company’s original chassis jigs are still used – and it will be unveiled at the 2018 Historic Motorsport International show at ExCel, London, on Thursday 15 February. Lister has revealed that the Thunder will have a top speed in excess of 200mph, with a 0-62mph acceleration of just over three seconds, thanks to a supercharged 5.0-litre V8 tuned by Lister engineers to give 666bhp. The Thunder’s bespoke bodywork changes have been overseen by Lister CEO and owner Lawrence Whittaker and are said to match or exceed original equipment. The carbonfibre front bumper is custom made, with an extended splitter giving greater downforce. Lister vents adorn the bonnet, and there are Lister decals on the side panels of the car, with the grille centre, decals and calipers matching the interior combination. The rear bumper is also bespoke, featuring a carbon fibre design, which houses the enlarged rear Lister carbon exhaust tips. A chrome-plated solid brass Lister badge adorns the rear spoiler, while at the front, an enamelled green and yellow racing Lister badge sits perfectly in the front grille. A carbon fibre bonnet will be available as an option, with a retro-fit carbon fibre kit also to be offered by Lister for existing Jaguar F-types from £19,950. The Lister’s interior is finished in the UK’s best Bridge of Weir Nappa hide, and is available in 36 colours. Lister logos are stitched into the headrests and the seat pattern echo’s the car’s grille. The dashboard, door cards, roof lining and steering wheel are all hand stitched in matching Nappa leather, with the seats, dashboard and roof lining also hand finished with a contrast stitching to match the accents of the exterior. This comes 25 years on from the launch of the roadgoing Lister Storm, a homologated race car powered by a 7-litre Jaguar V12 – the largest capacity V12 ever fitted to a production road car at the time. It had been inspired by an earlier project in 1986 by engineer Laurence Pearce, who built around 90 tuned XJS models using the historic Lister name, capable of 200mph and selling for over £100,000 each. The Storm took this further, and went on to be built for racing, winning the FIA GT championship in 2000, and further developed as a Le Mans prototype, the Storm LMP, for the 24 Hours in 2003. The Lister name, which originated with the company founder by businessman and racer Brian Lister in 1953, was revived again in 2013 when father and son team Andrew and Lawrence Whittaker bought the company and revealed plans to build ten Lister Jaguar Knobbly continuation cars – tool room copies of the highly-successful Jaguar D-type-powered race cars built by Brian Lister in the 1950s, using the same techniques, jigs and bucks as the originals. Lister continues to build the knobbly continuation models, and now offers a fully road-legal version of the Knobbly for the first time in lister's history, along with the magnesium-bodied Stirling Moss edition of the Knobbly and the Lister Costin, the version of the Knobbly designed by aerodynamicist Frank Costin for the 1959 race season. 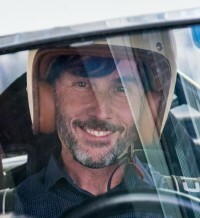 Speaking of the Thunder’s launch in mid-February, Lawrence Whittaker said: 'Like Brabus and AMG with Mercedes and Alpina with BMW, we are hoping to become synonymous once again with tuning Jaguar vehicles, giving customers new enhanced, bespoke performance and design alternatives to Jaguar’s acclaimed model programme.